The Voice of Stray Dogs (VOSD): A farm and home for all! You are here: Home / Welfare / The Voice of Stray Dogs (VOSD): A farm and home for all! “Compassion is not an abstract concept, it comes from doing. If you can, don’t leave a dog behind. 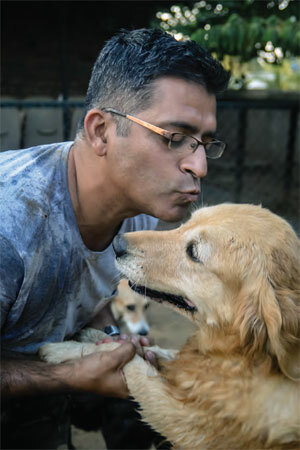 If you can’t, at least don’t be cruel to them,” says Rakesh Shukla, founder of The Voice of Stray Dogs (VOSD). 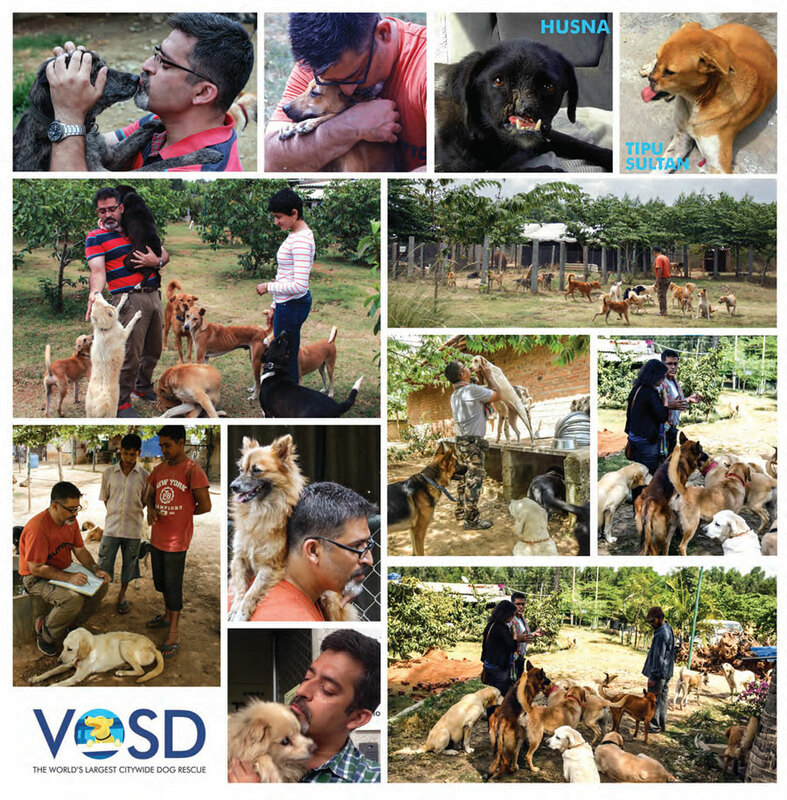 Based in Bangalore, VOSD has rescued over 7000 dogs till now. Over 5000 dogs have been released after treatments. VOSD Dog Sanctuary is a farm and home to me and all the dogs. We believe that any real love is best expressed in action rather than words. To protect dogs and help people protect dogs, I founded The Voice of Stray Dogs (VOSD). VOSD is my home as well as home for my dogs. It is rather a large one that has hundreds of four-legged kids. About half a ton of food is cooked every day, and we have our own hospital and staff. We also have a team of three vet assistants to give medical care and two vets who between them give us 40 hours of their time a week at VOSD. Every dog at VOSD has a name. All dogs are free within their enclosures, spread over an expansive 3.5 acre area. Each enclosure has a covered area, as well as a tree-lined open space. The enclosures have heaters during winter, and individual water bodies for the dogs to jump into and cool off in summer. The dogs also enjoy a ¼ acre artificial lake that we call ‘the swimming pool’. VOSD has never put down a dog for reasons of space, cost, or behaviour problem. Every single dog receives the best private veterinary treatment and that’s the reason many have undergone complex surgeries and procedures. VOSD aggressively treats life-threatening diseases like cancers, distemper and parvovirus among the furry buddies. We are currently running two crowd funding campaigns. These are focused on retired services dogs and five snout-less dogs living with VOSD. Husna is among the five dogs who were rescued without snouts and live at the VOSD Dog Sanctuary. Each of the dogs was rescued by VOSD Rescue and treated fully before they started living in the sanctuary. The other dogs in the sanctuary include Haider, who was rescued when he was three months old with a missing upper jaw 1200 miles away three years ago. Michael was rescued when he was 20 days old after an accident that left him without his lower jaw and has now lived at the VOSD Dog Sanctuary for over the last two and a half years. Tipu was one year old when he met with an accident and lost his upper jaw and was rescued by VOSD two years ago. Yadav was about one year old when rescued by VOSD with missing half his upper jaw six months ago. #PatriotDogs are the thousands of dogs who serve our country in Indian military, paramilitary, police and special-forces. More than 100 of these dogs will join 15 other #PatriotDogs from Kerala, Karnataka, Railway Police and military dogs already in VOSD’s care at the VOSD Dog Sanctuary in Bangalore. Leading celebrities and influencers from sports, entertainment and fashion, such as Virat Kohli, Rahul Dravid, Venkatesh Prasad, Chris Gayle, Nana Patekar, Boman Irani, Soha Ali Khan, Sanjjanaa Galrani, Kitu Gidwani, Divya Seth Shah, Ashwini Ponnappa, Prasad Bidapa, and Nitin Sahrawat have added their voices to support #PatriotDogs. #PatriotDogs are trained in various specialties like explosive detection, tracking down insurgents or terrorists, and mounting massive search-and-rescues. From the tender age of just two months, they serve our country through the prime of their lives—usually 8-10 years. It’s a sad fact that until recently, they were euthanised at the end of their service. Thankfully the Supreme Court put an end to this gruesome practice in 2015. VOSD is creating a purpose-built facility at the VOSD Dog Sanctuary for these heroes. The dogs who we choose to keep are with me because they don’t have any place to go and because they need constant care. They have all been gravely injured and have bravely fought death. They all have some condition that makes them unfit for release – most of them have missing eyes or limbs or other such conditions. 90 percent of them are Indian street dogs who lived on the streets before coming to VOSD. There are several pedigree dogs who had the privilege of living people’s homes before VOSD became their home. The reasons they have come to me therefore are different. The Indian dogs come because there is so much garbage on the road they have an unending food source, coupled with people’s indifference that causes car accidents and sometimes cruelty. In the case of pedigree dogs, it’s mostly age or some terminal or expensive to cure illness that makes people abandon their dog. Stricter norms for breeding, and better awareness for pet parents are necessary. A large part of it is also the generally poor quality and/or profiteering nature of vet care in India. For the same treatment and medical care, care for dogs is more expensive or non-existent. I don’t think of it as animal welfare, I’m allergic to that term as I am to being called a ‘dog lover’. The amount of love that I have received from these dogs is unparalleled. However, there is a tremendous sense of loss and heartache when one of them crosses the rainbow bridge because of the bond I have with them. I see myself as their father. However, I have learnt not be paralysed with grief as I must be there for everyone not just one. They are all special in their own way, some more than others. Just be always there for your elderly furry friends Celebs and their love for four-legged friends!